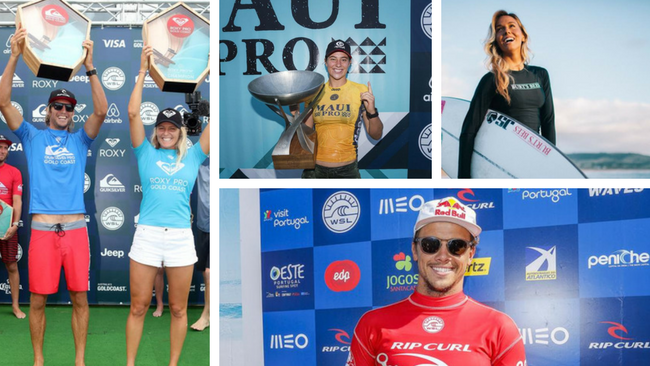 JUST two years out from the sports Olympic debut, Australian surfers go into the 2018 world tour season boasting the top three women in world surfing and a group of men with the potential to win world crowns. We take a look at the favourites in both the women's and men's world title races, the events they will contests, changes to the tour and the moments that will matter in our guide to the WSL 2018 season. The three clear favourites after the 2017 season are all Australian. Tyler Wright, Stephanie Gilmore and Sally Fitzgibbons filled the top three spots with Wright wrapping up her second world title at the Maui Pro. Incredibly Gilmore missed winning a seventh world crown by just one heat. Courtney Conlogue was a force early in 2017 and will be again this year with many also tipping big things from multiple world champion Carissa Moore from the US. Australia, the US and Brazil are in positions of power the men's ranks, snaring the majority of spots on the championships tour. 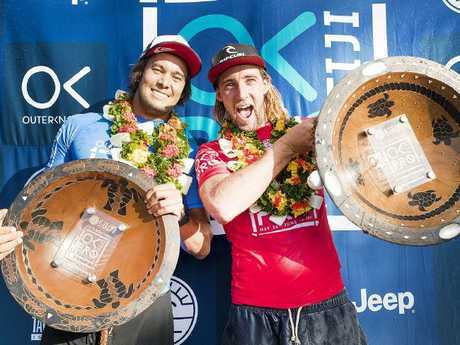 Australia's surfers are a mix of new and old talent, including former world champion Joel Parkinson, Mick Fanning for the opening two rounds, Julian Wilson, Matt Wilkinson, Owen Wright and last year's Rookie of the Year, Connor O'Leary. Matt Wilkinson, right, with Cronulla surfer and last year’s Rookie of the Year, Connor O'Leary. John Florence goes in as the defending champion after wining his second world crown in 2017. Brazilian Felipe Toleda is also being tipped for a big year in 2018. Tyler Wright and John Florence have to be the favourites for 2018 after winning the last two years. But in the women's race there is a lot of backing for Gilmore to match the extraordinary record of Layne Beachley in winning seven world crowns. Last season also showed Sally Fitzgibbons has the arsenal to finally win her maiden world crown with the biggest threats to the Australians likely to come from multiple world champion Carissa Moore and the hungry Courtney Conlogue. Watch out for Victorian surfer Nikki Van Dijk who broke through for her first WSL world tour win in 2017. In the men's competition many believes this could be the year for Julian Wilson, depending on how he comes back from a shoulder injury sustained pre-season. Gabriel Medina threatens as does Jordy Smithm Wright and Wilkinson. Watch out for Filipe Toledo who continues to amaze when on song. The World Surf League, or WSL, was formerly known as the ASP World Tour. The series is used to determine the men's and women's world champions of surfing each year after a series of events. The best female and male surfers compete in 10 events across the season and accrue points at each event. They are allowed to drop their worst two performances. The WSL rankings will also be used to determine which surfers will compete at the Olympics in 2020. There are some big chances for the 2018 world tour for both women and men. One of the most anticipated is the first WSL event at Surf Ranch in the US. Another is the fact the women's world tour will join the men's at Jeffreys Bay. The third is the fact that Indonesia will replace Fiji on the world tour with the inclusion of the Bali Pro. However events in Portugal and at Trestles in the US are gone in 2018. Reigning world champion Tyler Wright is an early casualty at Bells Beach. Australia's Julian Wilson is a big hope for Australia this season.